The NEPG is proud to introduce their new transponder scoring system that they will begin use of at round 7, the Jack Pine Enduro, in Moorestown, MI (July 17th). The new transponder, like the old ones, cannot be used around anything metal. 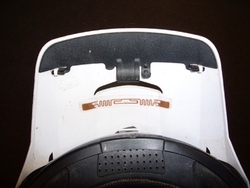 So with that in mind and after several tests using the new transponder and antenna, it was decided that the underside of the helmet visor was the best placement for the transponder. The transponders will be available at sign-up for a $10 fee, being that they are self adhesive there will be no rental program. They have proven to be very reliable and can be reused for many events. The new antennas will be much smaller and most of the time be strapped to a tree at the checks. You will still be funneled down to single file using track tape and there will still be the same displays after the antenna showing your row number and time. Our new scoring system will still be powered by MotoTally software. Providing you with the same check by check text and e-mail alerts, scoring on the two 40” monitors and complete web results we currently use.